I’ve had several people ask me what is involved in registering a trademark with the U.S. Patent and Trademark Office (USPTO). Your trademarks include the names, logos, tag lines, and anything else you put on your products and services to inform customers about the source and quality of what they’re buying. Once you have a trademark registered with the USPTO, you have the exclusive right to use your trademark on your goods or services anywhere in the U.S. If anyone tries to start similar business or sell a similar product with trademark that is too similar to yours, you can make them change it. The only companies that can have the same trademark as you are companies who were using the same trademark before you registered yours with the USPTO (i.e., the Burger King situation) or companies that use a similar trademark but on a product that is so different from yours that no one would think that they are owned by the same company (i.e., Delta Faucets, Delta Dental, and Delta Airlines). 1. Clarify what the trademark is and what products or services it’s being used on. You can only claim rights to a trademark that you’re using in commerce or expect to use within six months. 2. Determine if the desired trademark is trademarkable – not every trademark is. Your trademark can’t be the product itself. 3. Check the USPTO database to make sure no one else has registered the same trademark on a similar product as my client’s. 4. Evaluate if others are using the same trademark without registering it with the USPTO. Once your have a registered trademark, these companies can keep using it in their established geographic market, but they can’t expand without rebranding. 5. Complete the USPTO trademark application which includes determining the best description of the product and which class(es) of products we’ll be applying for. The USPTO charges a fee for each class of products you register the mark for. 6. Submit the application to the USPTO with the filing fee. 7. Wait three or four months for the USPTO to get around to reviewing your application. Yes, their backlog is that big. Once I submit an application, I typically check on it at the beginning of each month to see if it’s been assigned to a reviewing attorney at the USPTO. 8. Respond to any Office Actions if we receive any from the USPTO. An Office Action is a communication from the reviewing attorney that says that there’s a problem with the application. They may request clarification, a disclaimer, or claim that the desired mark can’t be registered. Depending on what the USPTO and my client wants will determine how I respond and how much work will be required. 9. Once the USPTO approves the mark, they will publish it on its official gazette. This puts everyone on notice that your mark is about to be approved. If no one objects within thirty days, your trademark will be registered. You should expect the entire registration process to take at least eight months, but it could be longer. Once you have a registered trademark, you can use the ® next to it. You will continue to have your trademark rights as long as you’re using it in commerce. The USPTO requires that you send in update affidavits periodically that verifies that you’re using the trademark. If you don’t use your trademark for three consecutive years, it will be considered “abandoned” and anyone can use it. If you’re looking for more information about what a trademark is and the benefits of registering it with the USPTO, I made a video about it. If you want to chat more about trademark registration, you can connect with me on Twitter, Facebook, YouTube, LinkedIn, or you can email me. You can also subscribe to the Carter Law Firm newsletter. 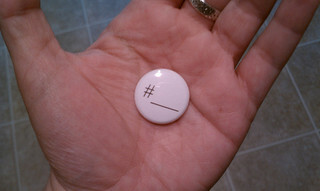 Can You Trademark a Hashtag? I spoke at TechPhx on Social Media Horror Stories from the Legal Trenches. One of the stories I told was Turner Barr’s experience with having his blog, Around the World in 80 Jobs, essentially shut down because another company registered the trademark in the same name. At the end of my talk, someone asked if you could register the trademark in a hashtag. A trademark is the words, slogans, logos, colors, packaging, etc., you put on your products that differentiate you from your competition. If you don’t register your trademark, you get the exclusive right to use your marks where you’ve established your market. When you register your trademark, you get the exclusive rights to use your marks on your type of products everywhere in the U.S. If you want to know more about trademarks, check the story behind the Burger King trademark. Just like you can register a trademark in a company name, product name, or slogan, you can register a trademark in a hashtag. The first rule is your trademark can’t be the generic product. If you own a coffee shop, you can’t register the trademark #coffee. If the U.S. Patent and Trademark Office (USPTO) let you have that, you could stop your competition from calling their coffee “coffee,” which would be very confusing. You could register your business name (i.e., #DansCoffee) or a slogan like #GreatMornings or #WheresMyMug. The second rule is you can’t claim a trademark that your competition is already using. If you were a soda manufacturer, you couldn’t register the trademark #Coke or #CocaCola unless you were the Coca-Cola Company. Another thing to keep in mind is when you register your trademark, you have to declare what you’re claiming as your trademark and what goods or services you’re using it on. You only get the exclusive rights to your mark in your arena of goods. You can’t stop another company from using a similar trademark on their products as long as they are completely unrelated. Registering a trademark is a long process. It can take months for the USPTO to look at your application and then there may be several rounds of communications between you and the USPTO before your trademark is approved. If you want to claim the exclusive right to use your desired hashtag, it should be for something that you’re planning on using for a long time. So can you register a trademark in a hashtag? Yes. Should you register your hashtag as a trademark? It depends on your situation. That should probably require a joint meeting with your marketing staff and your lawyers. If you want to chat with me about this or any other topic, you can connect with me Twitter, Google+, Facebook, YouTube, LinkedIn, or you can email me. You can also subscribe to the Carter Law Firm newsletter. The Digital Millennium Copyright Act (DMCA) is part of the copyright law. Its purpose is to protect people who provide online forums but don’t control the content people post to them – like YouTube and Pinterest. If they receive a notice that material on their site is allegedly copyright infringement, they must remove it. This law gives content creators a way to react to copyright infringement when someone posts their work online without permission. Instead of sending a cease and desist letter to the person who stole their work, they bypass them and deal with the infringer’s webhost instead. Lately, I’ve seen a few instances where people have been improperly using the DMCA to get material removed from the internet that they don’t like. I’m starting to refer to these acts as DMCA abuse. The DMCA should only be used for copyright issues – when you suspect someone is using your original content without your permission. Don’t use it to removed suspected instances of trademark infringement. In a recent incident, GoPro allegedly sent a DMCA takedown notice to DigitalRev’s webhost to remove a picture of its camera from the site. The photo was in article that compared GoPro against another camera. GoPro didn’t think DigitalRev copied their content, but that they were using a picture of the camera that had the wrong branding. GoPro should have sent DigitalRev an email with a correct image of the camera instead of getting the whole article pulled for alleged copyright infringement. This story really bothered me. Somebody copied someone’s original content onto their site, and then used the DMCA to claim that they were the real owners and get the original removed for its site. Thankfully the original author could get their work put back on their site by sending a DMCA counter takedown notice. Apparently this is a common incident. This behavior was so disturbing, I had to make a video about it. If you think you have questions about how you, your brand, or your content is being used online, please consult an intellectual property attorney. Don’t just send a DMCA takedown notice – that may not be the right tool to address your problem. When you send a DMCA takedown notice, you attest under the penalty of perjury, that your statements are true. If you send a DMCA takedown notice and it turns out what you did qualifies as what I call DMCA abuse, you may have committed a crime. For more information about copyright, please check out my book The Legal Side of Blogging: How Not to get Sued, Fired, Arrested, or Killed. You can connect with me on Twitter, Google+, Facebook, YouTube, LinkedIn, or you can email me. Can Kasperski keep the FnB Name? According to Phoenix New Times, he came up with the name and he likes it, but does that give him ownership rights in the name? A trademark is the mark used with a product or service that distinguishes it from its competition and informs consumers about the source and quality of what they’re buying. In regards to a restaurant, a mark could be the name, the way the restaurant is decorated (trade dress), logos, and/or slogans. When you have a trademark, you have the exclusive right to use it on your products or services in your established market. If your register your company’s trademark with the U.S. Patent and Trademark Office, you get the exclusive right to use your mark on your products and services nationwide. No one can start a business or create a similar product with a mark that is similar to yours. Unfortunately, no one has registered “FnB” with the USPTO for use with a restaurant. If Badman and Milic did that, they would have exclusive control over who could open an FnB restaurant anywhere in the U.S.
All is not lost in this story. If Badman and Milic can argue that they are known nationwide, they can make the argument that their established market is the entire country so no one can call their restaurant “FnB” without their consent. There was a case in 1948 about a fancy New York restaurant called “The Stork Club.” They had spent thousands of dollars in nationwide advertising and had been featured in news articles in newspapers throughout the country. They were able to force a small tavern in San Francisco called “Stork Club” to change its name because they made the argument that consumers might think the tavern was affiliated with the restaurant, which could hurt the restaurant’s reputation. What about Kasperski’s statement that he thought of the name? Trademark rights come from using the mark in commerce. From what I can tell, he’s leased property to a company that used the name. If he didn’t use it himself, he has no trademark rights in the name. According to Phoenix New Times, Kasperski claims he’s partners with Badman and Milic. I looked up Badman and Milic’s LLC and he’s not listed as an owner, so I’ve seen no evidence that supports that claim. Kasperski also said Badman and Milic will be successful without the FnB name. Given their success so far, that is probably true; however, that doesn’t change their rights in their business’ name. They were the ones who used the name in their business and build a stellar reputation. Unless there are contracts that explicit give Kasperski rights in the FnB name, I foresee him struggling to make a valid claim in the trademark rights. The take away lesson: If you want to avoid problems like this, talk with an intellectual property attorney about registering your trademark with the USPTO.